The PlusQuip range of workshop test equipment is about to expand with the release of the new EQP-117 Fuse Current Tester. The PlusQuip Fuse Current Tester can measure the current flow in circuits at the fuse socket location, by simply removing the fuse and inserting the required tester adapter. With the peak amp monitor function, any unusually high intermittent current draw in the circuit that may cause the fuse to blow and open circuit can be identified. This function can be used in conjunction with a wire harness wriggle test to pin point areas of possible harness faults if applicable. The PlusQuip Fuse Current Tester features a large LCD display with a backlight option which allows for easy reading of the numerical and analogue bar type display functions, and includes HOLD and ZERO functions to allow for accurate diagnosis. It is fast, safe and accurate (0-30A +/- 2.0%) and offers a measuring range of 30A / 48V / DC / AC. 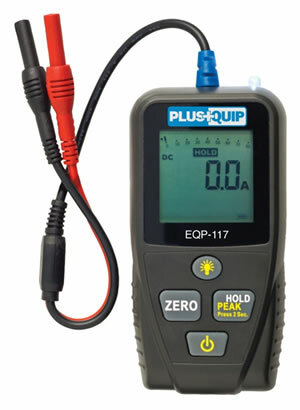 The EQP-117 current measuring test unit is suitable for both passenger and commercial vehicle electrical circuits. The PlusQuip Fuse Current Tester is hand held for easy use and is self powered by a 9V battery. It comes complete with three adapter harnesses which allows for versatility in the electrical circuits that can be measured and is a time saving device that all technicians should possess in their tool kits.